The internet has shown us a number of turnovers in the last decade, and one of the major areas, the internet had a significant influence is in the field of education. India has also seen a rapid transformation in education with the internet, and it has paved the way to replace black and whiteboards with projectors and digital boards. The influence of the internet on education is not just limited to that, but with digital education, we can learn as per our own terms, without limiting ourselves to the few hours within the concrete walls of schools or universities. With digital education, we can learn whenever and wherever we want, in the first place, and that is indeed the bottom line of digital education. That being said, there are a number of digital education apps and websites available today to help us learn and broaden the scope of our activities and get a splendid career. 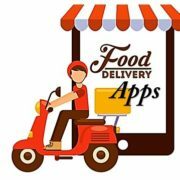 Among the apps and websites, only a few of them deserves its position in the top, which you should definitely try at least to make learning an exercise of fun. To know more about the advantages and scopes of digital education, you can read my article here. 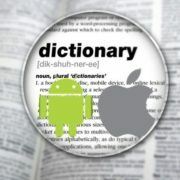 So without further delay let’s peep into the shining stars in the digital education category of the Google Play Store. The first one in our list is Khan Academy, which actually has all the reasons to be on the top. Get access to the complete NCERT, CBSE, GMAT, CAT, IIT courses to improve your base of learning and make your dream come true. The bottom line is, Khan Academy is completely free to use and you don’t have to pay a single penny to keep learning. 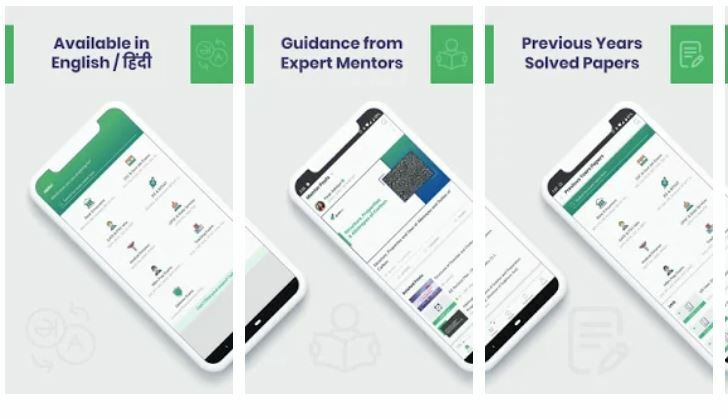 The learning catalogue of Khan Academy is not just limited to that, and you can view the impressive catalogue by opening the app or the Khan Academy website. 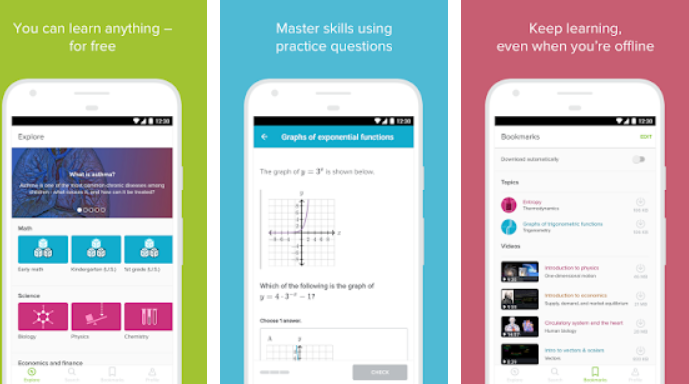 Khan Academy features 10,000+ video lectures and you can even keep practising on the app to make yourself perfect in whatever you are learning. Khan Academy also has a desktop website, which is equally feature-rich to help you get the best while learning. You also have the provision to download the videos to enjoy uninterrupted learning, just in case, you do not have a data connection. Start learning on Khan Academy today and be an active participant in the community of 60 million learners. The winner of the prestigious Startup of the Year Award. award Byju’s is one of the best learning apps targeted towards enthusiastic learners in India. Byju’s offers a comprehensive catalogue of different courses for different levels starting from 4th standard till 12th standard, apart from offering courses for different competitive exams like IIT, JEE, NEET, CAT, GRE, GMAT, Bank PO, and whatnot. Byju also offers video lectures to help you crack the campus placement tests to support you grab the job in your dream company after your college. Just like any other popular learning app, you can also take quizzes, appear in mock tests to ensure, you are on the right pace towards your destination. After a test, you can see an in-depth analysis to help you know your week points and the areas, you are strong at. 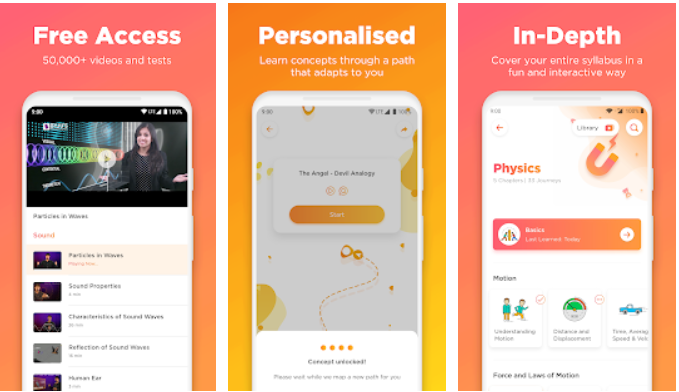 Byju’s also has a BYJU’S Parent Connect app to help the parents ensure, their children are learning regularly. If you are an IAS or government job aspirant, you can even watch regular videos on the Byju’s to brush up your skills on the different subjects like current affairs and know the worth knowing things that are taking place around you. 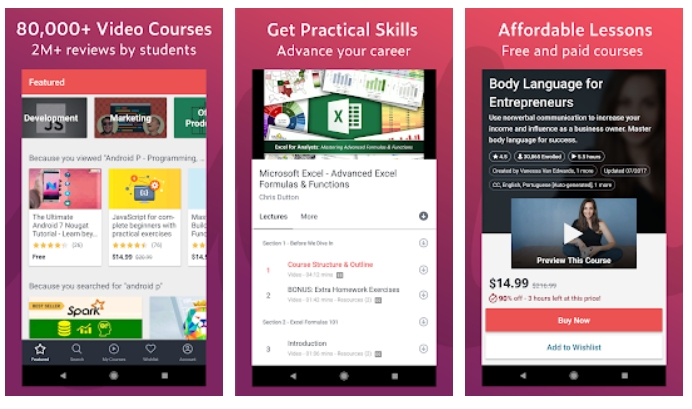 Byju’s is also free to download and use, but there are paid courses as well, which can help you get most out of India’s largest learning app. Want to learn everything under the sun, Udemy is the learning app that you should try out for sure. Udemy offers an unending catalogue of 80,000 and more videos from different domains like the app and web development, business, office productivity, personal development, designing, marketing, lifestyle, photography, health & fitness, teaching, yoga, and whatnot. Yes, the catalogue is too intriguing, to say the least. Both free and paid courses are available on Udemy to help you learn the best out of your budget. The paid courses on Udemy are quite affordable, and thus, it won’t be a burden on your pocket to upgrade your skills and learn better. Udemy is a vast community of 24 million plus students, and the videos are prepared by the experts in the respective subjects to help you learn the best. On Udemy, new videos are added regularly, and you can be the experts in every trending things of today like big data, SAP, yoga, UI design, etc. New courses are also added on a regular basis to help you be the winner in the race against the clock. The Udemy app is available in English, Portuguese, Chinese and Spanish to help you learn everything at your own convenience. Just like other popular education apps, Udemy videos can also be downloaded to view the same later when you are free. Looking for a robust platform to learn and improve your skills? Unacademy is the one that has nailed it. One of the best Indian platforms for both learners and educators, you can view video lectures on a plethora of topics and subjects, the Indians are interested in. Unacademy features a comprehensive catalogue of courses like CGL, UPSC, Bank PO, Railway examination, Pre-medical, JEE, GATE, Management examinations and what not. The best part about Unacademy is that video lectures are created by educators, and you can even be a part of the Unacademy team if you are an expert in any subject. 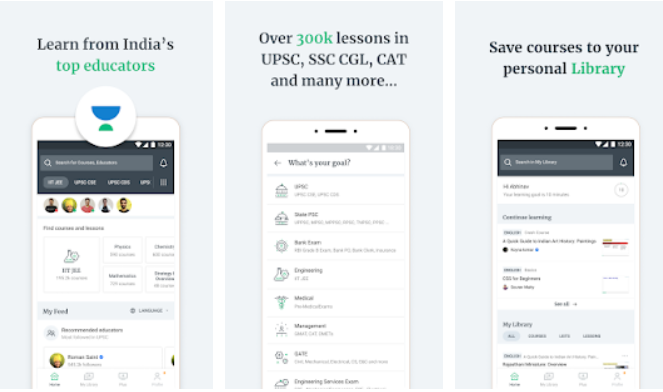 The ability to get videos and courses on different subjects from top educators is pushing the limits of Unacademy to make it the top education app in India. Some courses are free while others are pocket-friendly. Though you can even learn and upgrade your skills with the free courses of Unacademy, which are great enough to enrich your skills in the subject you are interested in. Just because Unacademy has a huge team of experts as educators, it has almost 8 million views every month, which undoubtedly is a satisfying number. Want to learn courses featured by the top universities in the world. EdX is the best pal for you. From computer science and programming to data science, engineering and business, EdX has courses for every single subject you can think of. Apart from those advanced courses, you can even choose courses of elementary levels like mathematics and science for high school and college, and many others. EdX feature around 2,000 online courses which is enough for you to comprehend how powerful the platform is. 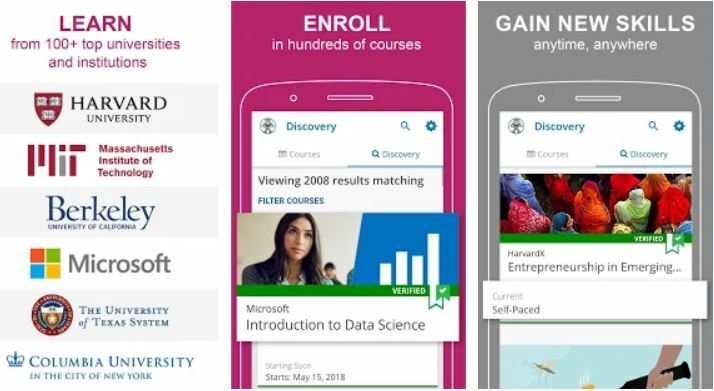 EdX offers online courses from the leading universities in the world like Berkeley, MIT, Harvard, and some leading companies, Microsoft being one of them. There is hardly any course untouched by EdX, which means, you can get literally all types of courses on the platform. Last but not least, EdX also offers you language courses, which can help you learn English, Spanish, Chinese, French to broaden your horizons of skills and get a wonderful career. If you want to learn new skills, and want to get certified for the same, just go for Coursera. The expertise of Coursera is not just limited to its ability to provide certificate courses online, but Coursera brings specialized courses from around 140 and more renowned institutions from across the world. The Coursera catalogue has a huge bunch of courses that comprise programming and web development, machine learning, statistics, data, marketing, accounting, entrepreneurship, robotics, chemistry, medicine, and a lot more. Coursera also has courses for a plethora of different other domains like music, photography, creative writing, and everything else that comes to your head. Just like the other educational apps, which I have already discussed, Coursera is also free to use, but you will have to pay a fee to get the certificate for a course. Coursera has around 2,000 courses, and chances are very less, you won’t be able to find a course that you are actually interested in. Just view the courses online or download the same to watch it whenever and wherever you are convenient to view them. Are you looking for a platform, where you can learn and appear for mock tests at the same time! GradeUp is the one you should go for. On GradeUp, you can prepare for a plethora of competitive exams like Bank PO and Clerk, SSC, Railway, JEE Main, NEET and a lot more. To keep an active pace of learning, and make sure you are learning in a result-oriented way, you can appear for the mock tests for the respective examinations and analyze your results. To eradicate the fear of the examinations, you can even get access to the previous year papers, which are solved by the experts in the respective subjects. On GradeUp, you can get learning materials every day to never miss a piece of important news as per the perspective of the exam you will appear for. GradeUp features a feed-like user interface just like Facebook, and other popular social networks, which comprise contents of different types like quizzes, photos, video lectures, new vacancies and many more. Just go through the feed to never miss an important update. GradeUp offers a comprehensive set of features that will surely help you to crack your dream job or nail an examination if you are already giving your best efforts. Want to speak English like a pro! Download Duolingo and start learning every single component of English to speak, read, and write English flawlessly. To make the learning process even more interesting, Duolingo even has a number of word games, to help you learn without making you feel bored. The games and exercises in the app are handcrafted only for the learners to make them tackle the real world challenges with confidence. The bottom line of Duolingo is that it is completely free to use. 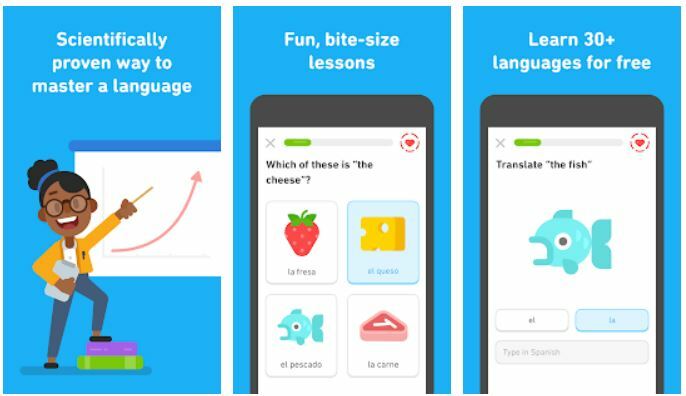 Duolingo has been downloaded a hundred million times, which again reaffirm its faith and popularity among the users of the app. Not only English, but you can even learn a plethora of other important languages on Duolingo, German, French, Italian, Spanish being a few of them. If you aren’t a bookworm but want to learn English and other popular languages the easiest way, Duolingo is the answer for you. 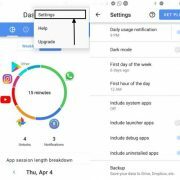 Depending upon what exactly you need, there are hundreds of other education apps available on the Google Play Store, and they all are undoubtedly good and deserve your time. I tried to keep the list as interesting as possible by listing digital education apps that will be useful for almost everybody. 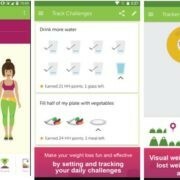 But if you are fond of learning new things every day, and want to keep upgrading your skills, the apps I mentioned here should be there on your smartphone to help you learn and make learning an exercise of fun. Are you in school and has big hopes to be the class topper or crack the toughest under-graduate competitive exams? I am sure, you are here for that, and Toppr will help you make your dreams come true with the free digital education app. Just like Khan Academy, Toppr is completely free to use, and it has almost every single element to help you nail your upcoming examination. 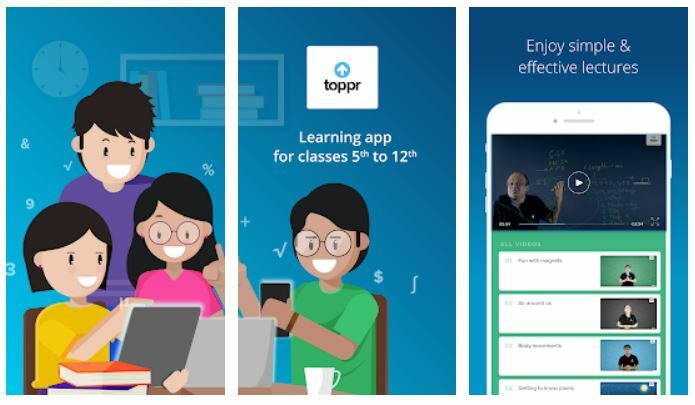 Toppr offer video lessons, quizzes, and educational games for all classes starting from class 5 till class 12, apart from the competitive exams like JEE, NEET, AIIMS, IIT, and other highly ambitious examinations. The video courses and the quizzes are available in both English and Hindi so that language never becomes a hurdle on the way of achieving your dream. Download the app, and get started by entering some basic information like your name, school, the standard you are reading in, subjects you want to learn, examinations you want to crack, etc. Start learning by watching the video lessons, and hence take part in the quizzes to evaluate your learning. You will also get a rank based on your performance to help you understand your position among the students across the country. Want to grab a job in the top IT companies in the world! SoloLearn is here for you. Learn the basics of coding, and a number of most popular languages like C++, Kotlin, Machine Learning, SQL, Python, and many others on SoloLearn. SoloLearn features small concept clearing lessons to make coding a piece of cake for you. New courses are also added regularly to SoloLearn so that you never miss an opportunity in the upcoming interview at your favourite IT company. 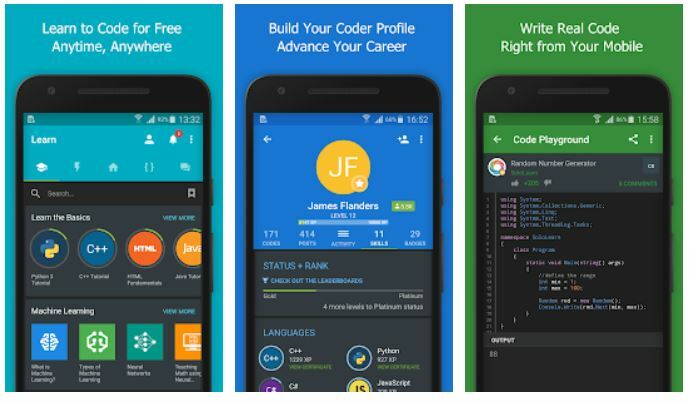 Just like other popular learning apps, SoloLearn is also completely free to use, and the goal of the app is to make you an expert in coding from the very basic level. 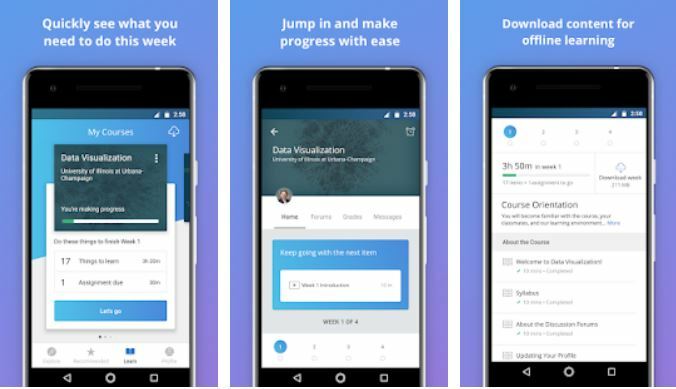 To help you practice on the go, SoloLearn features a mobile code editor, where you write codes, and run them to find out whether you are on the right track. The code editor doesn’t require additional hassles, which is yet another reason, SoloLearn is for the active learners, who don’t want any obstructions on their way of learning. SoloLearn is based on the most trending market trends so that you can keep yourself updated all the time with the latest advancements in the world of IT and technology. SoloLearn is worth downloading if you want to learn to code with fun. So that was it. Hope the information was helpful for you. Do you have anything to say? Feel free to comment the same down below.